Apache RTR200 4v is the topmost product from TVs in India till date in the Indian market. It competes directly against Bajaj Pulsar NS200 (2017 model). it's only available in carburetor fed version. moreover, fuel injection system and ABS version will come soon this year. New 2017 pulsar ns200 has 199.7cc displacement engine that gives the maximum power of 23.5bhp@8500RPM that is more than enough for the city ride and highway touring. Whereas Apache RTR 200 Gives 20.2BHP@8500 RPM. But the biggest difference is the refinement of an engine and here apache rtr200 wins. The engine is So Smother even at high RPM. 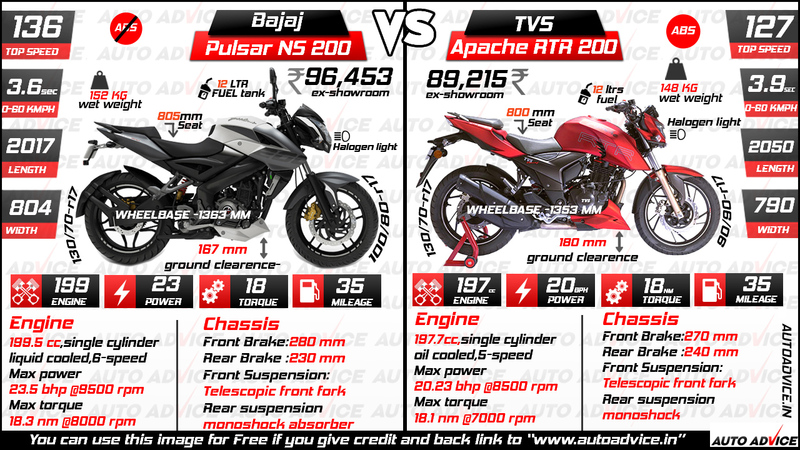 Moreover, torque is the same for both bikes 18NM but apache gives it earlier at 7000 RPM as compare to Pulsar NS 8000 RPM. Both bikes have amazing touring capability even you can take this bike to Leh-Ladakh. Honestly, Speaking TVS has slightly better Quality then Bajaj in India. As per my personal experience, my Apache RTR 200 never put up any problem since last year. whereas my friend who has pulsar AS facing the problem with gearshift and rusting beneath the engine. Both bikes are street naked and well design to impress the young generation of India. although RTR200 has the better front look with eagle eye DRL. Pulsar ns200 has higher bhp so it has better acceleration from 0-60 kmph in just 3.6 sec whereas apache RTR 200 scores 3.9 sec. This is not much different to talk about. Top speed of pulsar NS200 is 136 KMPH as compared to apache rtr200 has 127 kmph , but some videos on youtube show that apache RTR can cross 140 KMPL. Pulsar NS200 is slightly heavier, longer and wider then apache rtr200 .but apache rtr has the better ground clearance of 180MM. This helps the rider on off-road and bumpy roads of India. although both bikes have same suspension setups.Telescopic fork in front and mono-shock absorber at the rear. In real life, if you want performance then you have to sacrifice with mileage. Despite this apache, RTR is giving 30-35 mileage around the city and 35-40 on highway same as NS200. A free advice for you if you want better mileage then always ride 60-70 KMPH this is ideal speed for maximum mileage output. Here Apache RTR200 wins because of its approx 6000/- cheaper then bajaj NS200. India is a very competitive market for the automobile industry. these prices are showroom price and subject to change a bit according to states. If your budget is around 1,00,000 and looking for the best performance bike then these could be your options.As per my advice go and take a test ride before making up your mind.both bike are superb. you will never regret if you chose either NS or Apache RTR. if you have any question regarding these bikes please feel free to comment down below or mail me ask@autoadvice.in. Disclaimer: This is an Unbiased review by Auto advice .that means 100% honest.